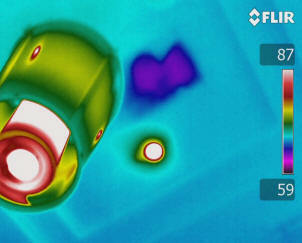 Infrared Energy Survey Services – $299 up to 2500 sqft. A Closer Look (ACL) Infrared Energy Surveys use interior infrared scanning of your home or business to allow our energy auditors to check the effectiveness of your house insulation and attic insulation in your building’s construction. The thermograms that our state of the art equipment generates, help our auditors to determine there are problems with your insulation, through wall conductive surfaces or air infiltration. Your energy auditor then decides which cost effective options are available to improve the energy efficiency at the building envelope level. In North Texas, interior scans are common during the summer months. Exterior scans may yield valuable information if taken during certain season and times of day or night, but the heat loading of the exterior walls over powers the small leaks that can be visible during the summer days. In addition to using thermography during an energy audit, you should have a scan done before purchasing a new or existing house. Newly constructed houses can have significant thermal defects in their thermal envelopes that can cost thousands of dollars in energy consumption over several years. You may wish to include a clause in the contract requiring a thermographic scan of a house or business before submitting your contract. Enhanced Infrared Energy Survey – $445 up to 2500 sqft. The Infrared Energy Survey thermographic scans can be performed in conjunction with a blower door test to increase air infiltrations and make detection of air leaks easier and to a much smaller detail. The blower door is used to slightly depressurize the house. This helps exaggerate air leaking through cracks and gaps in the building energy envelope. That leakage is even more visible with an infrared camera. CMC Energy Audit – $195 up to 2500 sqft. The CMC Energy Audit starts with a physical inspection of the property to collect information about the building envelope and major energy consuming products in the house. This information is recorded and then entered into computer software that creates a digital profile of the structure and energy consumption. That information is then used to determine what upgrades and improvements would generate a quantifiable energy savings in the home or business. The investment in energy savings products will yield a determinable decrease in energy consumption. This energy audit and report will provide a Return on Investment (ROI) measure in years for various options that you have to improve the energy efficiency of your home or business. Thermograms of electrical systems can detect abnormally hot electrical connections or components within the house. Dallas Infrared Residential Scans cover Electrical panels, Service Entrance Conductors and the Electrical motors in the typical house (HVAC compressor and fan motors, swimming pool motors, refrigerator, freezer, washing machine and dryer) to determine if abnormally high temperatures are detected. This may indicate pending electrical problems and potential component failures. Call us today to get a special 10% discount on our Infrared Inspection services through the month of March Dallas Infrared Energy Survey (or Enhanced Energy Survey) and the CMC Energy Audit. Both reports are provide in a “Green” digital formats. This is an electrical monitoring tool that provides real time data for your energy consumption. Easy to install clamps are placed on the service entrance conductors in your electrical panel that plugs into a wireless transmitter. Your energy consumption is recorded on a base unit that sits in your house, every 6 seconds for up to 7 years. The data is exportable via a network cable to your computer for easy analysis. A Closer Look Inspection Service provides real time temperature and humidity monitors in your house to determine the actual conditions that exist in your house and attic. This data is collected in a small USB probe installed in your house and the data is physically collected every 4 – 6 months. This data will document problem areas or conditions that can adversely affect indoor comfort. Use our monitoring service to record heat and humidity conditions before and after improvements are made to the property. Large commercial building such as ware houses, may have very large roofs. Locating roof leaks can be very difficult when you are talking acres of roof surface. Our Dallas Infrared Roof Scans use the properties of the water trapped in the wet insulation to ease the location of problem areas. Thermograms are very useful images when you can detect down to 1/10 of a degree temperature difference. Commercial block wall construct may have requirements for the cores to be concrete filled to a specified height or specific number of cores per linear foot. Dallas Infrared Moisture scans is an easy way to determine if these important engineering requirements are met. Thermograms of electrical systems can detect abnormally hot electrical connections or components and heat created by excessive friction and pipe blockage in commercial and industrial applications. Dallas Infrared Commercial Scans cover the Electrical motors and Electrical panels to determine if abnormally high temperatures are detected. This may indicate pending electrical component failure or mechanical component failure. A quarterly monitoring service can help provide a risk management plan for schedule maintenance. Our Infrared services can assist in troubleshooting and preventive maintenance for your plant or facility. You can reduce the risk of fire since electrical and mechanical problems can be found before total failure. Detect early failure in switchgear and electrical risers. Find bad bearings and gear boxes before they fail.